The Scottish LibDems like to proclaim their pro European credentials at just about every opportunity. They are widely regarded as the most pro EU party not just in Scotland but the whole of the UK. Now this is a position which I personally share. I too take a positive view of the EU, so this post is not a criticism of the LibDems’ pro EU position. Rather I want to express my surprise at how little contact the Scottish LibDems seem to have with their fellow Liberals in the EU. I was prompted to write this after reading in the Catalan newspaper La Vanguardia a short report on a visit by Sir Graham Watson, the leader of the Alliance of Liberals and Democrats for Europe – ALDE. The report is headlined, European Liberals do not see any problem with an independent Catalunya in the EU. The report then quotes Graham Watson as saying that the EU must be sufficiently strong and flexible to allow the creation of new states within its frontiers. The report in full can be found here. Now such views are completely at odds with what the LibDems are saying in Scotland, where we are threatened with possible expulsion from the EU, or at best, years of uncertain negotiation. Certainly nothing that would suggest a positive welcome from the EU. Yet here we have the President of the Liberals and Democrats in the European Parliament offering a warm welcome to Catalunya. Something seems to be amiss here. In large part this may be due to the fact that the Scottish LibDems do not seem to be a member of the ALDE. I checked their website, where they include a list of all the member parties across Europe, both in the EU and outwith the EU. The Scottish LibDems do not appear in this list of members. The UK LibDems however is a member party. I found this rather surprising as many countries have two or more parties with membership of the ALDE. Of most relevance for the Scottish LibDems, there are two Spanish parties in the ALDE. Convergència Demmocràtica de Catalunya – CDC – is the Catalan Liberal party, while the Centro Democrático Liberal – CDL – campaigns in the rest of Spain. Both are members of ALDE. So there would appear to be no reason why the Scottish LibDems could not also become members of the ALDE. Of course one reason for their absence from ALDE may be that the Scottish LibDems are not in fact an independent party in their own right. Perhaps they are just the Scottish wing of the UK party. Though they have their own leader in Scotland, Willie Rennie, they do not seem to have their own direct links with fellow Liberals in the rest of Europe. Perhaps if they did, they might be a bit more nuanced in their outbursts on Scottish independence. Clearly not all their fellow Liberals are opposed to this development. In fact at least one fellow Liberal party is very much in favour of independence – for Catalunya. There it is a bit of a surprise to discover that the leadership for both a referendum and for a yes vote for independence comes from the Catalan Liberals – Convergència Democràtica de Catalunya – CDC. There are clearly different views on independence within the family of Liberal parties. With this in mind it would be interesting to know if anyone from the Scottish LibDems has met with CDC to discuss their different views on independence? It is very odd that such a pro Europe party like the Scottish LibDems does not seem to have any direct links with other Liberal parties in Europe. I have written to Willie Rennie to ask him what is the Scottish LibDem position in relation to the ALDE. I have also written to ALDE to ask if that Alliance has at any time discussed the possibility of independence for Catalunya and for Scotland? It is clearly an issue of great importance and I would imagine that it will be discussed at various levels in Europe. It is just a pity that our LibDems in Scotland should be so out of step with the President of their party in Europe. Why do we need Private Energy Companies? The recent series of price rises announced by our energy companies has been greeted with dismay, shock and anger. Which is not surprising, given the scale of the increases and the importance of energy supplies to all households. However, anger on its own achieves nothing. The UK government seems to want to use these price rises as an excuse to downgrade our commitment to renewable alternatives. One expects nothing better from the Tories, but Labour have nothing to offer either. Their UK leadership is proposing a price freeze, but only if Labour are elected in 2015. And then what? No-one seems to know. Calling for a price freeze when you do not know for certain the finances behind the companies strikes me as pretty silly, and pure electioneering. In Scotland the SNP have at least approached this from the perspective of maintaining the renewable sector. They have promised, if elected in an independent Scotland, to remove the cost of renewables from energy bills and pay for them out of general taxation. However this is just a start. We need to move on to ask why do we need so many energy companies at all? And do they need to be private companies? The whole rational for privatisation was based on a false premise – that competition would secure investment and bring down prices. Now reality has confirmed that much needed investment, in renewables for example, will only happen with the support of government subsidies. While there has been precious little in the way of prices coming down. With privatisation tariffs have become ever more opaque and confusing. It is nearly impossible for anyone to work out the tariff that offers them the best deal. The reality seems to be clear for all to see – the energy market is not in any meaningful sense a real market. The supply side of gas and electricity is dominated by the Big Six energy companies, which control over 90% of domestic customers. These six companies also control over 70% of UK generating capacity. With the next four largest generating companies, the Big Ten control over 85% of energy generation. Since privatisation there is precious little evidence of genuine competition. Certainly there appears to be none when it comes to prices. When one company raises prices, the others follow suit very quickly and with more or less the same price rise. Very suspicious. Yet not really surprising at all. After all the supply companies all use the same resource. It doesn’t matter which company you use, the gas and the electricity is exactly the same. So it is not at all clear why there would be significant price differences. Which begs the question of why we need all these private energy companies in the first place. Previously we did not of course. There was one, very large company for the whole of England and Wales, while Scotland was served by two companies – one for the South of Scotland and another for the North. Privatisation in the 1990s changed all this. The rush to privatisation seems to have been solely undertaken for ideological reasons. For the then Tory government – the Thatcher/Major governments – privatisation was simply a matter of belief. Private was good, public was bad. Which of course flies in the face of reality. It is ironic that one of the major energy companies, EDF, is part owned by the French government. With ten large generating companies and six very large supply companies it is all but impossible to work out just how much rigging of the market goes on. Or how much excess profits these companies make. When does a profit become excessive anyway? It is not clear why the generation and supply of energy has to be at the mercy of private profit. Just about everywhere it is a monopoly or near monopoly market. We need to look again at forms of public ownership of our key natural resources and utilities. Why are politicians in the No campaign so unwilling to answer questions from members of the public? I have tried on various occasions and each time, the reply, if it came at all, completely ignored my questions. The most recent example of this comes from Alistair Darling. Now Mr Darling is apparently the leader of the No campaign and is rarely absent from our broadcast media. Constantly asking the Yes campaign to provide clear answers. Yet when he is asked to provide some clear answers, none are forthcoming! Recently I sent him an email in his capacity as leader of the Better Together campaign. I wanted clarification about comments he had made on the Sunday politics Scotland programme which was broadcast on 29th September of this year. In it he repeated the claim that an independent Scotland would not have been able to save the Royal Bank of Scotland at the time of the financial crisis way back in 2007/08. I have always regarded this oft repeated assertion as one lacking any substance. around 160 in the rest of the world. So, it is clear that a lot of money was needed to save the Royal Banking Group. However as they themselves make clear, they are an international company and not just a Scottish company. Indeed their chairman informed a UK parliamentary committee that only 3-4 per cent of the RBS group’s customers are in Scotland. Most of its UK customers will be with the National Westminster, which is an English bank and registered in London. The bit that operates up here in Scotland, the retail bank with branches all over Scotland – The Royal Bank of Scotland – is only a very small part of the RBS group, with around 300 branches in Scotland. In light of these facts, I wanted to know why the government of an independent Scotland would have been expected to bail out the whole RBS group all on its own? If Scotland had been an independent country, would it not have been the rUK government in London which would have taken on responsibility for RBS group’s operations in England, Wales and Northern Ireland? Particularly as the RBS group received money from the USA government via its rescue package – TARP – for its companies in America. I went on to point out that there seems to be a similar case at the moment in respect of Santander bank. 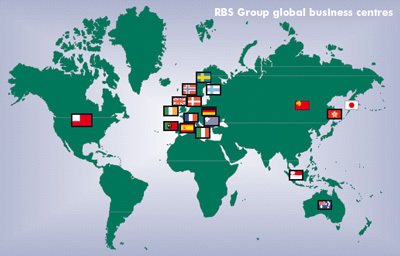 Like RBS group, Santander describes itself as a global and multinational bank. In its case it is based in Spain. However one of its companies is Santander bank in the UK, which is registered in London. I asked Mr Darling which government would have the responsibility for Santander UK, if the Santander group was to suffer a financial crisis? Would it be the UK government or the Spanish government? His response? Well, to my disappointment, Mr Darling did not reply at all. Instead I got a long winded email from a Nigel Anthony, Research and Engagement Officer, Better Together. In this response there was only one, single reference to RBS – The total support provided to RBS in 2008 would have been the equivalent of 211 per cent of Scotland’s GDP. Now despite Better Together’s dodgy record with numbers, I am prepared to accept this figure. However, it has absolutely nothing to do with my questions. Mr Anthony’s reply did not at any point make any attempt to provide some of the clarity they so demand of others. In fact from reading his reply, no-one could guess what the questions were. He just ignored them and dished out a dash of propaganda. Very disappointing from the No campaign and even more disappointing that Mr Darling is happy to approve of this kind of shoddy and disdainful way to respond to a question from a member of the public. Then again, perhaps not. The last thing that Project Fear want is to be forced to answer direct questions. Much easier to just spread lies and scare stories to tame journalists. This is a brief introduction to the political situation in Catalunya, in particular with respect to the campaign for independence. It is a slightly longer version of an article that I wrote for Radical Independence Dundee. Catalunya is in some ways a bit behind Scotland in that there is as yet no agreement with Madrid on the holding of a referendum and thus no question. However polls consistently show a large majority in favour of holding a referendum. Surprisingly there has historically only been one party that has campaigned openly for independence. This is the Left Republicans – ERC – one of the historic parties in Catalunya. After a brief flirt with the right in the early post Franco era, ERC has rediscovered its leftist and republican roots. It has also for many years led the call for independence in the Catalan parliament. Its electoral support fluctuates between 8 – 14% of the vote. Recently they have been joined in parliament by another pro-independence party. The Popular Unity Candidacy – CUP – is made up of autonomous local groups based in municipalities. This new community based party comes from the radical alternative left and won 3% of the votes at the last election. This is pretty much the position of two other left wing parties which campaign together at elections. ICV-EUiA represent two different political traditions, marxist and green. Initiative for Catalunya Greens – ICV is a merger between what remained of the once powerful Catalan Communist party and the Greens. Some of its members split to form their own little party, one that was formally linked to the Spanish wide United Left party – IU. In Catalunya they are known as the United and Alternative Left – EUiA. Despite the schism they work with ICV as a combined list for elections and win between 7-10% of the vote. They are very strongly in favour of a referendum and the right of self-determination. They are though split around how to vote. Some favour independence, while others want a New Federalism for the whole of Spain. Unfortunately there does not seem to be much of an appetite for any kind of federalism in the rest of Spain. In Catalunya as in the rest of Spain, Nationalists have not been historically in favour of independence. They don’t really want federalism either, they want a special status for the country within Spain. In Catalunya there are two Nationalist parties, a small Christian Democrat party – UDC, and a larger Liberal party – CDC, which work as one at elections as Convergència i Uniò – CiU. They have been the dominant force in electoral terms post Franco, winning between 31-47% of the votes. They represent the catalan speaking middle classes and have close links with the business sector. Initially their main aim was to protect and promote the catalan language, but now they want greater fiscal powers. CiU have recently moved even further to the right and are following with gusto the dominant neo-liberal austerity agenda. But then so is just about every other party, including some so-called left parties. As in Scotland there are three parties campaigning against independence. The main one is the Spanish conservative party, the grandly named Popular Party – PP. Even more right wing than CiU, they are totally against not just independence, but against just about everything to do with Catalunya. No referendum, no new powers. Though popular in most of Spain the PP have never achieved much electoral success in Catalunya, and win between 10-13% of the votes. They are however ably supported by a relatively new formation, Citizens – Party of the Citizenry – C’s. Just about their sole purpose is to oppose independence and the promotion of the catalan language. They have jumped from 3% to winning 8% of the votes at the last election. The third party in the No camp is the party of the Catalan socialists – PSC. They are also part of the Spanish wide party – PSOE. PSC are in a difficult place just now. They are in favour of more powers for Catalunya, but when last in office, a few years ago, they failed to achieve much in this respect. Despite the fact that there was a socialist government in Madrid at the time. They support the referendum and talk vaguely about federalism, but offer nothing specific. Their big problem is that some of their members and more of their voters are in favour of independence. Their fellow socialists in the rest of Spain are as hostile to the referendum and to Catalan independence as the right wing PP. They even use the same pejorative and negative language. The above is a rough outline of the political parties represented in parliament. However most of the progress towards the holding of a referendum and towards independence has come from grass roots, community based groups up and down Catalunya. Only the CUP has actively participated in these movements. It was these groups which from 2006 onwards organised a series of mass participation campaigns which has propelled independence into the forefront of the political debate. These included unofficial municipal referendums, mass rallies and this year’s Catalan Way. 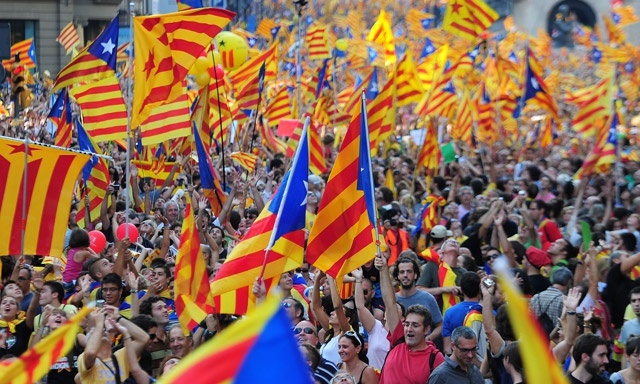 The most spectacular of these campaigns was the one in September 2012 which brought out more than a million people under the slogan – Catalunya, new state in Europe. This was a game changing event. The ruling CiU coalition decided, after the event, to support their demand for a referendum. The Liberal part of the coalition has now come out in support of independence. The first time a Nationalist party in Spain has declared for independence. Their junior party, the Christian Democrats have so far remained behind, and now talk vaguely about some kind of third way. As mentioned above this massive grass roots campaign is causing grave problems for the Catalan socialists. The main struggle at the moment is to secure a legal basis for holding the referendum. The Madrid government is adamant that such a referendum is unconstitutional and will do everything in their power to prevent it happening. The Catalan government of CiU with the support of ERC are threatening to hold a referendum anyway. They claim they have the right to self-determination. Underpinning all this is the grave economic and financial crisis which is causing enormous suffering to millions not just in Catalunya, but in the whole of Spain. Both the conservatives and the socialists share the blame for this appalling state of affairs. For many on the left in Catalunya the economic mismanagement and the negativity on constitutional change of both Spanish parties raises some real challenges. In essence, can any Spanish government be trusted to bring about real progressive social and economic change? No one knows how this will develop in Catalunya, but the two largest political groups could be on the verge of a massive split into pro and anti-independence sections. 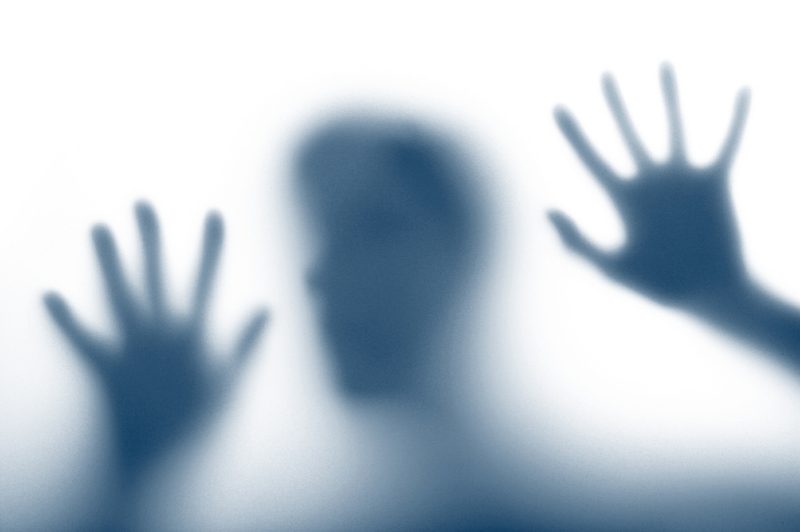 Is Tavish Scott trapped in a Dark Room? It would appear so, judging by his recent incoherent utterances on the subject of Scottish independence. The debate last month in the parliament was a case in point. Mr Scott regaled us with a series of rather wild assertions. One cannot even dignify them as arguments, as there does not appear to have been any rational thought behind these claims. In an effort to get some clarification about his comments I sent him an email way back on 20th September and after no reply, resent the email on 3rd October. This time I sent it to his constituency address as well as his parliamentary address. Still no reply of any kind. Perhaps he is trapped in a dark room somewhere! I am somewhat bewildered as to how anyone could possibly make this assertion. I am even more bewildered that Mr Scott, a member of a party that likes to proclaim its internationalist credentials could make that assertion. Such an assertion could only make sense if Scotland was to be the first country in the world to be contemplating independence. Yet as Mr Scott must certainly know, dozens of countries in Europe alone have become newly independent in the last couple of decades. Seven of these newly independent countries are now full members of the European Union. To wit: Estonia, Latvia, Lithuania, Czech Republic, Slovakia, Croatia and Slovenia. With the exception of the Czech Republic, all these states are smaller than Scotland. I am not sure if any of these seven countries started their new independence with a walk in the dark, but they have all successfully made the transition to independence. In most of these cases they have done so smoothly and with no apparent difficulties. At least none that were unsurmountable. They have all managed to secure full international recognition, including by the UK. They have all successfully set up the institutions of independence – establishing embassies, forming their own defence forces, setting up their own taxation systems etc, etc. So my first question to Mr Scott was, given the proven and successful experience of other newly independent countries, why did he claim that independence for Scotland, and it would seem, only for Scotland, would be a walk in the dark? What evidence did he have that led him to claim that Scotland would not be able to make as smooth a transition to independence as the seven aforementioned countries? I mentioned evidence as I assumed that he would not be so dishonourable as to make an unfounded claim. In his speech he went on to talk about international events, where he claimed that, “the UK’s collective strength is immensely more powerful than the individual voice.” He then went on to make three specific claims. The first related to the United Nations. He stated, “I do not understand why any Scot would actively seek to lose a place on the United Nations Security Council.” Once again I am rather bewildered by this assertion. I was completely unaware that Scotland had a place on the UN Security Council. The UK does. As far as I am aware there is no mechanism in place for the UK Prime Minister or Foreign Secretary to seek the approval of the Scottish government before casting the UK’s vote. The decisions on how to vote in the UN are taken solely by the UK government. Which is responsible to the UK parliament. In which there are only 59 members from Scotland, out of 650. So I asked if he could explain to me how in these circumstances he can justify his claim that Scotland has a place on the UN Security Council? Mr Scott’s second assertion on this issue related to the European Union’s Council of Ministers. He claimed that through our membership of the UK we somehow carry the most votes possible in these Council meetings. This I find most strange, for two reasons. The first is that on areas where there is a divergence of policy between the Scottish government and the UK government, the Scottish position is simply not heard in the European Council meetings. So there are in some cases 0 votes for the Scottish position. On the other hand where the Scottish and the UK position is the same, independence would increase the votes available in Council meetings. This is because the UK would have the same number of votes as at present, while Scotland would have its own votes to add to the pot. Thus I contend that far from losing anything in the EU, independence would be a win win for both Scotland and the UK. Mr Scott’s final point on international issues was that independence would mean, “to cut the record level of overseas aid to assist in Africa and countries around the world that are less fortunate than us.” This assertion again does not stand up to much scrutiny. If an independent Scotland continues to spend its current share of the UK’s overseas aid and the UK simply maintained its share, then the total amount spent on overseas aid would remain the same. I was therefore at a loss as to how independence in itself would mean a reduction in total overseas aid spending? We do not know what will happen to overseas aid in the future. An independent Scotland might well decide to spend more on overseas aid. That would be a matter for the Scottish electorate to decide. On the other hand the UK’s overseas aid budget might well be decreased in the years to come. It could do so, irrespective of the views of our 59 MPs at Westminster. Once again independence, and only independence, gives us the opportunity to ensure that our views are enacted. David Cameron was at it again this week. 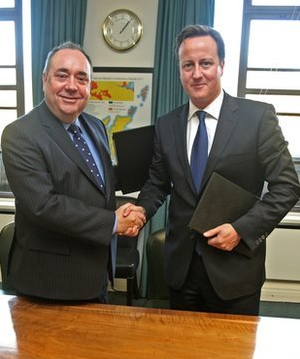 Boasting about how determined he is to campaign to keep Scotland within the UK. There appear to be no limits to what he will do to maintain this Union. Except, that is, participate in a debate with Alex Salmond. He, Cameron, cannot participate in such a debate because the whole independence debate is a matter for Scots living in Scotland. Which begs the question as to why Cameron continues to take every opportunity to intervene in this campaign. Why does his government spend taxpayers’ money in cooking up scaremongering reports which have the sole aim of belittling Scotland? He took it one step further in his speeches at the Tory party conference. In one speech he called on Tories to go back to constituencies in England and campaign to save the United Kingdom. So much for this being a matter for “Scots living in Scotland” and should not become a glorified general election. Just what are Tories in English constituencies supposed to do in their campaigning? And who are they supposed to convince? It all seems a bit defeatist to me. It is almost an admission that the Unionists cannot create any enthusiasm for the Union in Scotland, but by golly we can get them all fired up in Surrey and Kent. It is all very strange and not at all convincing. Just why does the rest of the UK want us to stay? 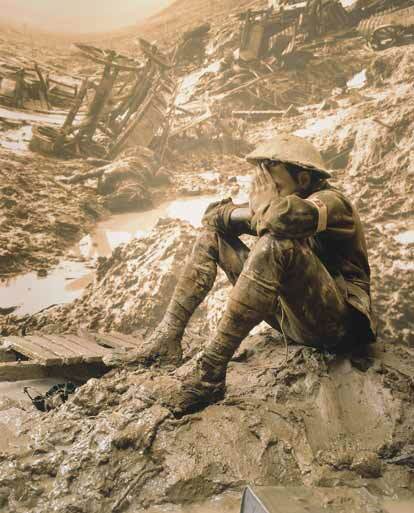 A bit of history and a very vague “all the things we can do together”. I would have thought that at this point he might have mentioned some of these great and wonderful things we could do together. But nary a one! Nada, zilch, nichts. Not much of a rallying call! It would be very helpful to voters here in Scotland, especially to undecideds, if Mr Cameron could in fact tell us just what Scotland offers the UK. After all the Better Together is not meant to be just about Scotland. Not that you would notice from their propaganda. Which is all about how Scotland benefits from the Union. Hardly a word is said about what Scotland contributes to the UK. Presumably it must be a great deal. Otherwise why would they be so desperate for us to stay? Yet they cannot or will not come out and openly say why Scotland is such a great and essential asset to the UK. I think we should be told. A final point about the importance of Scotland at the Tory party conference. Just about every speaker contrived to get in a reference to Scotland and how bad it would be for us to leave and sometimes, how good it would be for the rest of the UK if we were to stay. However, it was most noticeable that this concern was not shared in the least by the English media. In today’s Guardian there is no mention whatsoever of Scotland and the coming referendum in its coverage of Cameron and the Tories. As I have mentioned before, this is either because they are so convinced that independence will not happen, or because, deep down they don’t really care. I would just love to be a fly on the wall at one of these tory party constituency meetings when they discuss how to campaign against Scottish independence.